With all the family gatherings, the Christmas holiday often provides a wonderful opportunity to discuss Christ with unbelieving family and friends. Yet this can also be a stressful and tense time, especially for former Catholics. The deeper appreciation for grace, the fresh beauty of the Bible, and the urgency of personal faith that are not always shared with Catholic friends and family can fuel a zeal that regularly clashes with unsuspecting (and sometimes resistant) guests or hosts, turning Christmas dinners into annual trainwrecks. He explains each point further here. Well worth a read. 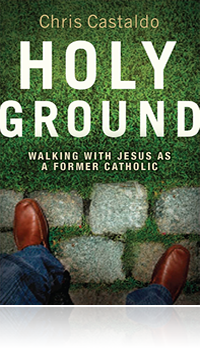 Chris has also written a book published by Zondervan called Holy Ground: Walking with Jesus as a Former Catholic. It is a humble, sensitive, and winsome approach to understanding both why many people make the move from Catholicism to evangelicalism, and how to interact charitably and winsomely with Catholic friends and family. I highly recommend it. We have free floating guilt, can identify the Ave Maria within three notes, and likely have rosary beads somewhere in the attic. We also own at least one study Bible, listen to sermons in the car, and know that a ‘quiet time’ is different from a nap. We are followers of Christ who grew up Roman Catholic and are now Evangelical Protestants. We wrestle with a series of challenges. Religious guilt still nips at our heels, and Christmas dinner at your brother Philip’s house is more than a little awkward (the one who is the Grand Poo-bah of the Knights of Columbus). I was simply trying to give thanks before eating our meal, and for some reason Aunt Louise is now compelled to recite the Hail Mary. It’s going to be a long night. Some of us have walked with Jesus as Catholics before we moved in an Evangelical direction. Others of us were converted to Christ as we made the move. Either way, our ambition is simple. We now want to live for Jesus Christ by embodying his grace and winsomely share it with Catholic friends and loved ones. And this is precisely where the challenge begins. Drawing on hundreds of interviews with former Catholics who are now Evangelical Protestants, Chris has spent the last two years uncovering their most burning questions and concerns. In Holy Ground he walks the reader through these issues with personal warmth and pastoral sensitivity. If you are tired of scratching your head in confusion about how your Catholic background relates to your current faith and why on earth your Catholic family believes you’ve gone off the deep end, you need this book. More than providing historical perspective, theological reflection, and practical lessons,Holy Ground is a dynamic exploration of how to emulate the grace and truth balance of the Lord Jesus Christ in relation to the Catholic people we love. ← Can We Sing ‘Joy to the World’ When We’re Grieving? If I were still Catholic, I’d be tempted to venerate Brandon Levering.